There are some TV news stories that seem particularly personal---that hit close to home on an emotional level. The recent mega motor vehicle crash on I-90 near Vantage, Washington was one of those stories for me. Eastbound lanes of Interstate 90 near Kittitas are closed for several days after a 25-vehicle crash pileup and poor visibility due to the wildfires. 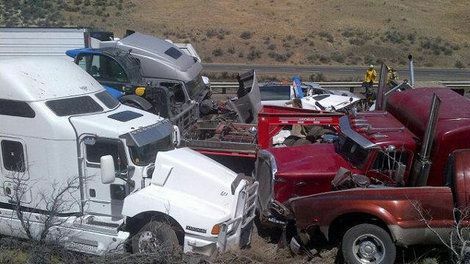 According to the Washington State Patrol (WSP), 15 cars and nine tractor-trailers crashed in the Interstate 90 pile up, leaving 11 people injured. When I saw the story on the news and the images of the accident captured from a helicopter high above the scene I, like so many other people, was shocked by the scale of the disaster. But my heart sank when I heard the reporter say that visibility on the stretch of I-90 where the accident occurred was limited due to smoke from nearby fires. I literally felt a chill as I heard those words. You see, I have had to drive through similar conditions at that same location. For the past several years our family has spent a great deal of time every summer enjoying the warm weather and flowing waters on the Columbia River in Eastern Washington. We’ve loved boating, concerts at the Gorge Amphitheatre, the wineries, etc. In 2012 and 2013, we spent a weeks in the area---any many weekends. On several occasions we have been driving on I-90 either coming or going from Seattle to Eastern Washington and found ourselves suddenly driving in thick smoke from brush fires near the highway. It is one of the most terrifying experiences you can possibly have while driving. Thick brown smoke creates blackout conditions. You can't see the road at all. You can't see the cars in front of you. You have no idea how much of the road is covered by smoke. You have no idea how long it will last. You have no idea if the road in front of you is straight or curves. You turn on your car lights and squint in an effort to try to see something. The inside of the car starts to smell and fill with smoke. You are afraid to drive forward for fear of running of the road or crashing into a car in front of you. You are afraid to stop for fear of being hit from behind. You feel panic. You are certain that a crash will happen at any moment. It's a nightmare. All we could do is slow down, turn on the lights; turn on the flashers; and proceed with extreme caution. Fortunately for our family, each time this has happened we have been lucky enough to quickly get to the other side of the smoke without incident. And after the second time that it happened to us we started listening to the radio for information on the driving conditions during the dry summer months. Once I took an exit several miles before the smoke field—thanks to a traffic advisory. On another occasion I pulled over when I saw smoke on the horizon so I wouldn’t have to drive through it. Is The Smoke Really To Blame? Who Is At Fault For The Multi Car Pileup? Was It An 'Act Of God / Nature'? Because I am married to a personal injury attorney and work in his office I know the personal stories of other people who have experienced this same situation and were not as lucky---people who have been injured in accidents or have lost a loved one. It's heart-breaking. Many people who are involved in situations such as these sometimes falsely believe that they cannot file an insurance claim because a natural occurrence, such as a wildfire, is “nobody’s fault” or is an “Act of God” and therefore responsibility/fault cannot be determined. Insurance companies profit from this erroneous assumption. But such accidents may not be faultless in the eyes of the law. The key issue in determining fault or liability for a car accident—regardless of the weather—is negligence. No matter what the conditions a key factor when determining liability is the answer to the question, "were each of the drivers involved in the accident acting in accordance with the standards of care that a reasonable person would follow in similar circumstances?" Some might assume that this accident was caused by an ‘Act of God / Nature’ because drivers have no control over the wildfires and poor visibility. But the individual car accidents were not caused by fire and smoke. The motor vehicle collisions were most likely caused by a driver, or perhaps several, who was driving too fast in a situation in which a reasonable person would have slowed down, been more cautious, or perhaps even pulled over before reaching the danger when they saw smoke on the road in front of them. One person making a poor choice could have a huge impact on many others. The smoke didn't push cars into one another. There is an excellent article on our website entitled Insurance Companies Unfairly Use The ‘Act of God’ Defense To Deny Car Accident Claims that explains the 'Act of God' defense in much greater detail. 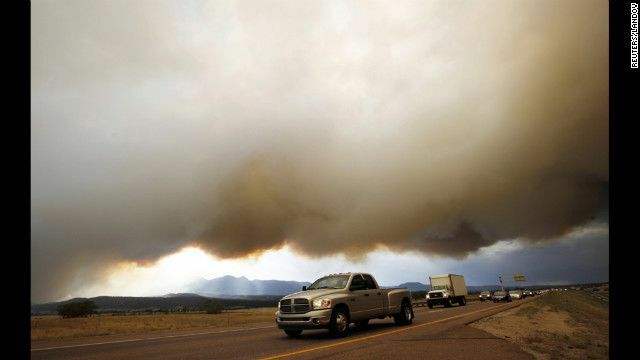 If you have been injured or have lost a loved one in a motor vehicle accident that happened during a “natural disaster” or wildfire smoke conditions you may benefit from the assistance of an attorney that has a great deal of experience handling serious accident claims; negotiation with insurance companies; arguing against ‘act of God / nature’ defenses, and successfully litigating such cases. You may have more options than you think.